Designed accordance to CE, CB and CCC standards. The system power supply for ail the delegate units is provided by the main frame at 24V safe voltage. Built in power supply cevice anc signal amplifier can support more groups. Can be offered with or without vobng facility. Equipped with BALANCE socket for connection interface voting result device. Support the function of video camera auto-track. Designed by the latest digital technology. 1.5m long cable with 9P-DIN plugs for system connection. High quality condenser cartridge equipped with windshield cover. 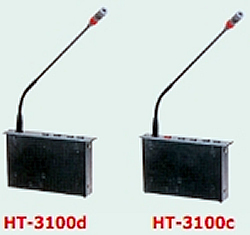 The red indicator lamp shows the state of the microphone. 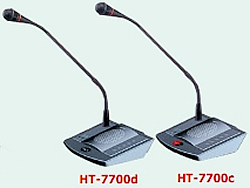 When the microphone is on, the built-in loudspeaker and the neighboring linking delegates loudspeaker are muted automatically to prevent feedback. Equipped with an earphone output jack and a RECORD output jack. Equipped with an earphone output jack and wireless mic input Jack.